SpaceX is launching the planet’s newest oceanographic satellite this evening. Here’s the scoop on Jason-3, and how “sea level” is one of those little white lies you learned in school. SpaceX is launching Jason-3 on a Falcon 9 rocket later today. The satellite will provide oceanographic data for everything from tide forecast to continue monitoring decadal variability in ocean heights. The subsequent forecasts are essential for public safety, provides key data for ocean shipping, and will help improve models for hurricane intensity forecasts and El Nino predictions. 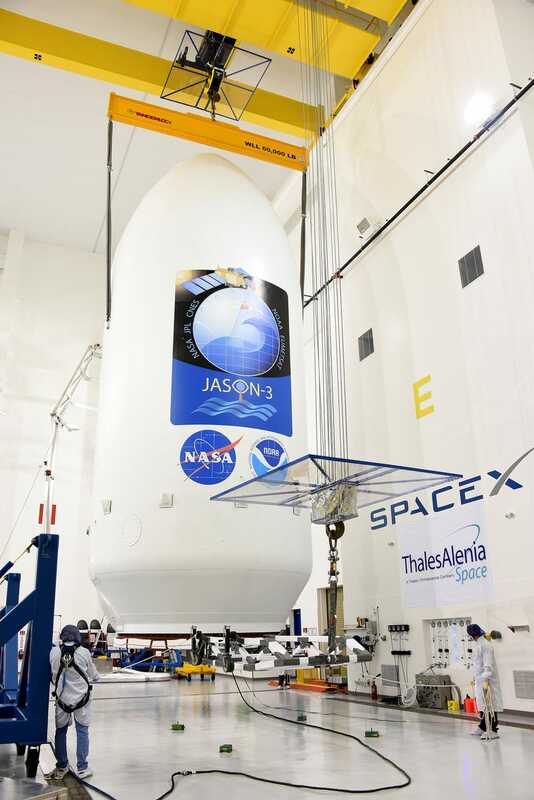 Jason-3 is scheduled to launch out of Vandenberg’s Space Launch Complex on Sunday, January 17, 2016. The 30-second launch window opens at 10:42:18am local time (6:42pm GMT). If it scrubs, SpaceX has a backup launch window tomorrow at 10:31:04am. The launch will use an older-model Falcon 9 rocket (v1.1). 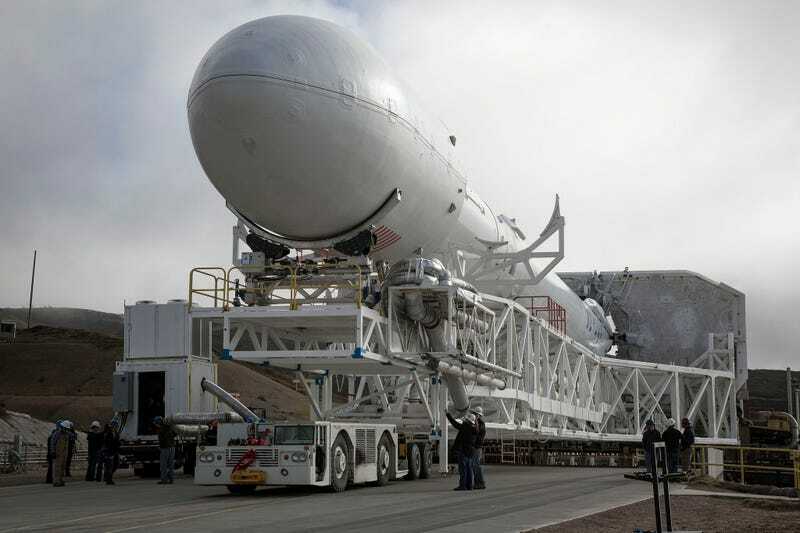 After, SpaceX will be making their first attempt at a barge landing in the Pacific Ocean. The satellite is going into a near-polar orbit to enable global coverage every ten days. The orbit is prograde and not sun-synchronous, which will help it avoid picking up a bias from tides. This orbit is why the launch is out of Vandenberg—the curve in California’s coastline allows the rocket to launch south without endangering civilians below its flightpath. SpaceX is certain it fixed the weak strut problem that led to last summer’s explosion, but standard safety practices only clear launch paths that don’t go over habited areas just in case. SpaceX successfully landed a Falcon 9 rocket on the ground at Cape Canaveral in Florida last month. They have yet to successfully land a rocket on a barge. The joint US-European oceanographic satellite is tasked with measuring ocean topography, monitor hurricanes, and supplement data for forecasting. That sounds a bit funny because isn’t sea level, well, level? But the ocean isn’t flat. Wind and waves create tiny frantic ripples up through graceful undulations, while the moon pulls up enormous tidal bulges. Water contracts and expands with temperature, and gets piled up by impatient currents. It all adds up to sea surfaces that can vary by as much as 6.5 feet (2 metres). (And that’s before dealing with the relative rise and fall of coastlines themselves making “sea level” an almost laughably inconsistent standard. But why bother measuring how sea surface heights change? Sea surface height is a window into ocean dynamics. By looking at the wild, wonderful messiness of reality and comparing it to a perfectly flat idealised ocean, scientists can watch how our ocean changes over time. The second-by-second change of individual waves passing is most interesting to surfers, but it’s the longer duration changes over weeks and years that fascinate scientists. By characterizing how the ocean surface changes, researchers can better understand currents and eddies, but also weather events like hurricanes, El Niño, and La Niña. The global perspective and decades of data allows researchers to spot global sea level rise, an average of less than a tenth of an inches per year (3.3 mm/year) that is easily masked by local coastal variability. When paired with drifting ocean floats providing spot-measurements of temperature, salinity, and depth, the data is invaluable for understanding ocean dynamics, warming and chemistry. Ignoring all the valuable research contributions that will be made by this wealth of oceanographic data, Jason-3 will also be used for more pragmatic ends. Sea surface heights can be used to derive ocean heat capacity, which is essential for hurricane intensity forecasting (especially important in a world where devastating hurricanes can build in mere days). Wave height measurements allow NOAA to issue high wave warnings to ship operators. Monitoring currents is also critically essential to the smooth running of ocean industries. Daily current updates help shipping operators and commercial fishers pick better routes, and allow search and rescue to predict possible drift paths. It even gives fixed facilities like off-shore oil platforms and ocean-based wind power farms warning of incoming inclement conditions. 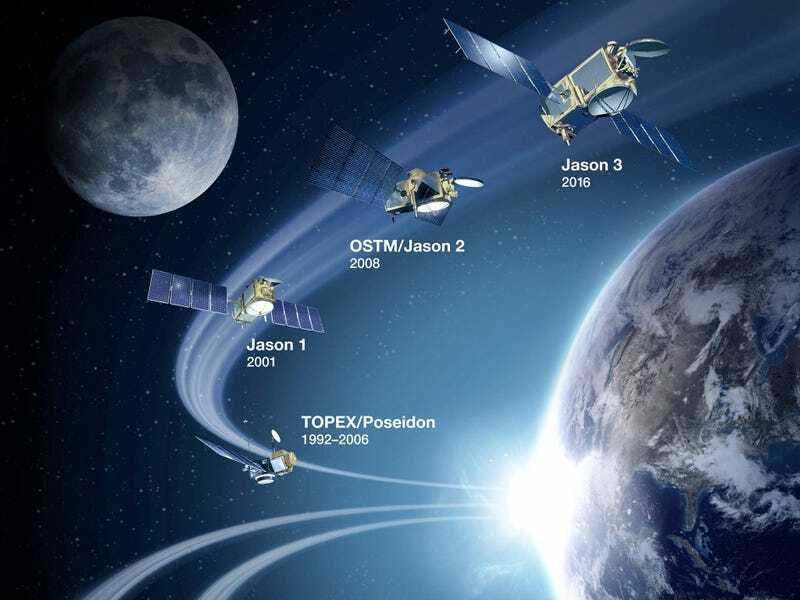 Jason-3 is carrying five primary instruments to measure sea level, wave height, and ocean surface wind speed. The instruments an altimeter to provide ocean data, radiometer to poke at the atmosphere, and positioning instruments. The Poseidon 3B Altimeter is the main instrument essential to sea surface measurements. It bounces microwave pulses from the satellite off the sea surface and measures round-trip travel time to determine sea surface height. The shape of the returned radar pulse also provides data on wind speed and significant wave height. It’s a slightly new style that permits automatic transitions between two modes. The modes allow the satellite to use whichever technique—prioritising acquisition or tracking—is more effective over coastal areas, inland waters, and ice. The Advanced Microwave Radiometer (AMR) measures how the two frequencies of radiation emitted by Poseidon are slowed by the atmosphere. Each wavelength offers insight into water vapor and liquid water content, and allows for greater accuracy in the altimeter measurements. It has a new trick over old radiometers—it will occasionally point into cold space to be calibrated. The only way for the first two instruments to work is if scientists know the precise orbital height of the satellite when calculating distances from round-trip travel time. Jason-3 has a suite of positional instruments for this purpose, nailing its radius from the Earth to under an inch (1-2 cm), an improvement over the 4 inches (10 cm) of earlier Jason spacecraft. This amazing accuracy will be accomplished by using a GPS receiver, a doppler locater (DORIS), and a laser retroreflector array (LRA) to bounce laser beams from calibration ground stations. It’s also carrying an additional passenger instrument, the Joint Radiation Experiment. The experiment is a pair of instruments—CARMEN-3 and Light Particle Telescope—that will measure radiation. The dosimeters will be used to assess electronic risks. This is the last of the planned Jason-series satellites. The first was Jason-1, launched in 2001 and capable of measuring ocean heights to an accuracy of 1.2 inches (3.3 cm). Jason-2 launched in 2008. Both are still operating today. Each new satellite has an overlap with the last, allowing for intercalibration and data continuity for an unbroken monitoring record. Jason-3 will be in the exact same orbit as Jason-2. They both pass over a pair of ground stations—Corsica and an oil rig off the California coast—for even better calibration. It will be nicely poetic for Jason-3 to launch during this year’s Godzilla Hyperfantastic El Niño, since it is the descendent of the TOPEX/Poseidon altimetry satellite that allowed scientists to predict the 1997–98 El Niño. If everything goes well, Jason-3 will operate for at least three years, with a goal of five or more. 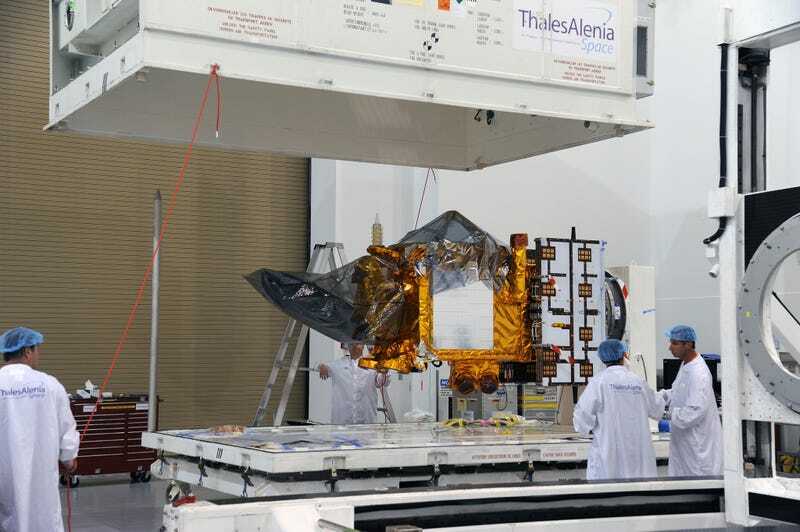 The satellite was built in France by Thales Alenia, and will be run by a partnership between the United States’ NOAA and NASA along with the French space agency (CNES), and the the European Organisation for the Exploitation of Meteorological Satellites (EUMETSAT). The space agencies will run satellite operations, and use the data to enhance climate research and add to the global ocean sea surface data record. The weather agencies NOAA and EUMETSAT will handle data distribution, and apply the data to operational forecasting.